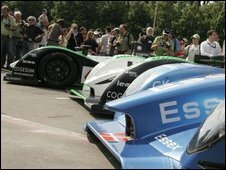 A quarter of a million fans travel to the Le Mans race every year. It is a balmy summer's evening in the quiet village of Mulsanne, on the outskirts of Le Mans in Northwest France. It is also pleasantly peaceful - until the silence is rudely broken by the frantic, ear-splitting scream of a racing engine at full throttle. The painful glare of super-bright headlamps pierces the dusk, while the smell of burnt fuel taints the air. This assault on the senses means that practice has got under way for the Le Mans 24 hours, one of the oldest and most famous events in the world of motor racing. 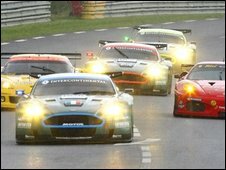 The race takes place mainly on public roads, where for a day commuters' cars and freight lorries make way for streamlined 200 miles per hour monsters. A quarter of a million fans from across Europe flock here every year, while many more watch the race on television. And like football supporters, they are pretty tribal, turning up festooned with flags, shirts and hats proclaiming their loyalty to marques such as Porsche or Aston Martin. This year, however, the event takes place against a backdrop of unprecedented gloom within the car industry, culminating in the bankruptcies of Chrysler and General Motors. At the same time, around the world, companies are tightening their belts and cutting back on spending as they face up to the grim realities of recession. You might expect all of this to be taking a heavy toll on the motor racing industry. Sponsors say investing in motorsport makes sense, even during a recession. Yet here at Le Mans, you would hardly notice. In fact, the entry list is looking healthier than it has done for years, with the likes of Audi, Peugeot and Aston Martin all fielding large teams. And multinationals do not seem to lost their appetite for racing either. Names such as Total, Gulf Oil and Sony all flash by at high speed. "Motorsport is all about marketing", says Chris Aylett, chief executive of the Motorsport Industry Association. "During a recession, companies need exposure for their brands, perhaps more than ever. So as long as we hold audiences, we will hold sponsors". 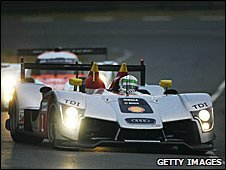 The German carmaker Audi has decided to continue competing in events such as the Le Mans 24 Hours, despite a drop in sales that saw its profits fall 29% in the first three months of the year. "A brand like ours needs to be involved in motor racing," says Audi's head of motorsport, Wolfgang Ullrich. "It gives credibility to what we do, it is an important part of our branding. "Of course we cannot ignore the economic situation. We have cut back our motorsport activities this year. But what we are doing offers good value." One company logo that is inescapable here at Le Mans is that of the oil giant Shell. It is everywhere, on cars, on motor homes and on trackside banners. Even in bars. Company executive Richard Karlstetter agrees that investing in motorsport can still make sense, even during a recession. "Our interest is mainly technical," he says. "We can learn a huge amount from competition. Our perspective is really long term. "And we can be winners during the downturn, because we can prepare products now to sell afterwards." Although motor racing has not been left unscathed by the downturn, it clearly has not experienced the bloodbath that many within the industry had feared either. Motorsports Valley is the nickname given to a part of southern England that is home to thousands of engineering businesses, from Formula One teams to nut and bolt suppliers. It is a good barometer of the health of the industry as a whole, and according to Mr Aylett, it is weathering the storm well. "In this area we're seeing cutbacks of around 15% a year, but we aren't seeing any big closures, we aren't seeing mass layoffs," he says. But one part of the industry is facing a crisis. Ironically, it is the richest part. 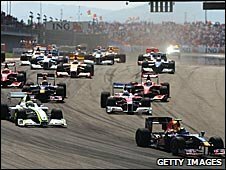 Formula One has commercial revenues worth about $1bn a year - with billions more coming in from sponsors and team owners. But it is also financially incontinent. Until recently, top teams were spending close to $500m a year each. In December, Honda abruptly withdrew from the series, unable to justify such huge expenditure at a time of collapsing car sales and disappearing profits. Now, the remaining teams are engaged in a bitter standoff with the sport's governing body, the FIA, over plans to cap their spending at a fraction of current levels. Yet, while all this has been going on, new teams have been clamouring to join F1, attracted by the prospect of a budget cap that should make the series more affordable. Even if the FIA gets its way, F1 will not come cheap. It will still cost each team some $80m a season. But the new entrants don't seem worried. So is F1 really a victim of the recession? Perhaps not. Even in the boom times, its appetite for money looked unsustainable. The downturn may simply have brought common sense to bear. Standing beside the circuit here at Le Mans, it seems pretty clear that the motor racing industry as a whole is weathering the downturn well. There are still plenty of investors buying into the world of horsepower and high speeds. They are simply looking for better value for money.